Does he want to celebrate birthdays only at five-star restaurants? Do you two argue about how to spend money, on “things” (him) versus “experiences” (you)? Does he buy only the best kinds of items: the latest iPhone, the best computer, an amazing backpack, and ridiculously expensive glasses? She laughed and laughed, saying that those were exactly the things he had recently bought, and that she had seriously objected to! Her angels gave her solutions, such as accepting his generous gifts without telling him he should have spent the money on more frugal choices, and many more pieces of advice, and so they are on their way to understanding each other much better now. Let’s turn to today’s language of love: TOUCH. When I say “touch” and “business,” do you think the two are completely incompatible? If your customer speaks the love language of touch, how can you possibly “speak” that language in an appropriate way? 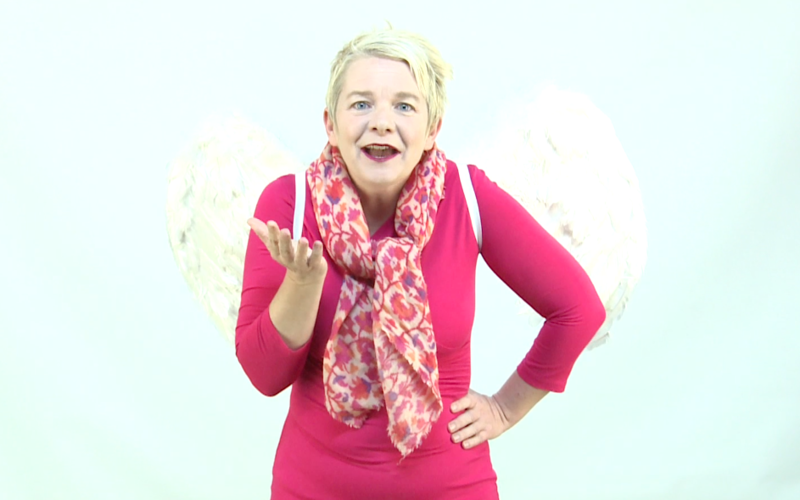 You can watch this video to find out how I explain it as “Your Business Angel” on the web tv channel My Big Startup, or keep reading below for the explanation. I bet you know someone who hugs you and holds your hand while speaking to you. Another clue if she is always fidgeting, rubbing her hands together, or playing with a pen. As soon as you see actions like these from your customer, that’s your clue! 2. Once you know the customer’s language is Touch, how do you speak it? Allow her to feel the product that you’re selling, if it’s a physical product like a handbag or a computer keyboard. Give her an actual sample to touch. Give her a sample of the product, let her test-drive the car, or try on the jacket. Set up a showroom. Don’t sell things just online, where people have to imagine the quality. Open a store, even if it’s a pop-up or a Saturday seminar. Definitely don’t keep your product behind glass or only on the internet. Do let people test, taste, and touch so they can FEEL the quality. Here’s the video version again if you want to see me act out these tips! When we speak the language of our customer, he or she can understand us better and trust us more than if we just speak our own language. With trust, it’s much more likely that we’ll win the customer and earn their confidence as well as their money! When I have random clients who have never heard me on radio or seen me on TV, they often have misguided expectations – for example, that I can speak to their deceased grandmother, or that I’m a fortune-teller. Nope! I’m a psychic coach who gets the inside scoop from your angels and Spirit Guides to give you advice for the best life going forward. On Facebook, I just got a 5-star review from a client named Tsholo who came in to do a TV segment with me of live coaching for her business. Right before we went on air, she told me she had watched all my youtube videos, so she knew exactly what she was getting into. More than that, as a fashion designer Tsholo used the language of “touch” to show me her products: she was wearing one of her skirts, which was a grey pencil skirt with a fantastic ruffle on it, and she brought me a set of gorgeous bracelets as a thank you. Which crosses over into the language of GIFTS, last week’s topic. Do you know how to speak the love languages of YOUR loved ones? If not, maybe that’s one reason you are not seeing eye-to-eye and heart-to-heart! When we don’t know our partner’s or children’s love languages, we feel like we’re doing everything right for them but getting no appreciation. Frustrating! Let’s figure this out together. Hit reply and we’ll book you in for a session. In your personal call, we can answer your love languages question and more! You get TEN questions in each session, with detailed follow-ups. Your angels know who you are! They want you to have the best life possible! The ten-question landline session is currently US $175 or R 1750. Book your session now by hitting reply to this email, and Charlotte the manager will help you choose your time and date! Wishing you rich rewards in business and life!